The holidays are upon us and it's usually the time where most of us don bright, colorful makeup. It's the perfect excuse to pop out your glitzy glosses and shimmery eye shadows. And the queens of glam know that to get the most sparkle, you gotta use pigments. Pigments are loose powder that can used as eye shadows, lipsticks, highlight, or gloss. 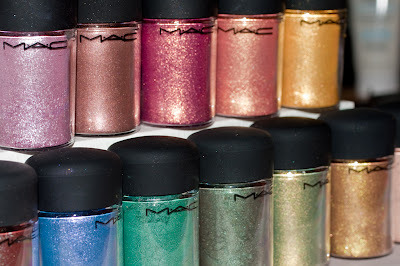 Unlike a regular eyeshadows, lipsticks, or glosses, pigments give a intense color with a slight sparkle. Want to highlight your cheeks? Dab a pigment color on your cheekbones. Want to make your own lip gloss? Mix a clear gloss with a pigment color of your choice. Want a intense eyeshadow color? Apply the pigment color over your eyelid as you would do to a regular eyeshadow color. You can even add pigments to a body lotion of your choice. You can use pigments in more ways than one which is great because you add more value to a product, thus giving you more for your money. Play around and see what you can create with your favorite pigment colors.